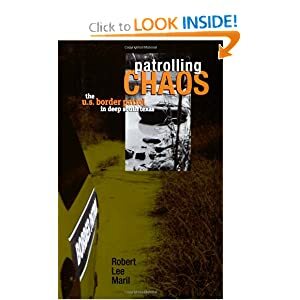 Patrolling Chaos: The United States Border Patrol in Deep South Texas, Robert Lee Maril, Texas Tech University Press, November, 2004. Paperback, 2006. Read a review of Patrolling Chaos from The Austin Chronicle here. Waltzing with the Ghost of Tom Joad: Poverty, Myth, and Low-Wage Labor in Oklahoma: Robert Lee Maril. University of Oklahoma Press, 2000. Paperback 2002. Living on the Edge of America. Robert Lee Maril, Texas A&M University Press, 1992. Poorest of Americans: The Mexican Americans of the Lower Rio Grande Valley of Texas. Robert Lee Maril, The University of Notre Dame Press, 1989. Paperback, 1990. Condos and Cannibals: Texas and Texans along the Coast. Robert Lee Maril, Texas A&M University Press, 1986. Read a review of Condos and Cannibals here. Texas Shrimpers: Community, Capitalism, and the Sea. Robert Lee Maril, Texas A&M University Press, 1983.